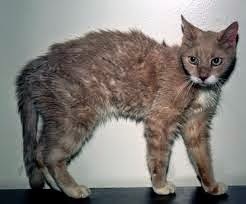 Hyperthyroidism is a common glandular disorder in cats. The thyroid regulates your cat's metabolism and produces a hormone called thyroxine that controls many body processes. When your cat's thyroid is overproducing thyroxine, your cat's metabolic rate increases and your cat is said to have Feline Hyperthyroidism. It usually appears in older cats and more often in females. Hyperthyroidism can have serious consequences and affects every organ in your cat’s body, including: kidneys (due to the blood passing through too quickly), digestive system, heart, liver and nervous system. Not every symptom may be present, but listed below are typical signs of feline hyperthyroidism. Just as with conventional treatment of human thyroid issues, there is a vast difference between how conventional and holistic veterinarians approach feline hyperthyroidism. From a conventional veterinary standpoint, the focus is predominantly on treating the thyroid gland itself as an isolated entity in an attempt to regulate the production of excess thyroid hormones. Treatment can consist of medications, radioactive iodine treatment or surgery. While medical management of the thyroid may be needed, a holistic veterinary approach encompasses much more. Feline hyperthyroidism is actually a symptom of an immune system gone awry, an imbalance in your cat's overall immune function. Feline hyperthyroidism is most often a symptom of autoimmune disease In other words, the immune system is attacking the thyroid tissue. Therefore, to help your cat improve, you have to not only regulate your cat's thyroid condition but also try to modulate your cat's immune system. The first place to start in addressing your cat's hyperthyroidism is to revisit your cat's diet. Typically cats with hyperthyroidism have a history of digestive problems. Since the majority of your cat's immune system is located in the digestive tract, diet is key. Foods such as grains, chemicals, poultry, fish, soy and starchy carbohydrates could have been causing a great deal of inflammation in your cat over the years. Change your cats diet to a hypoallergenic regimen, preferably a raw frozen diet if possible or canned being sure to avoid the most common food allergens such as poultry, fish, grains, soy and dairy. Check to be sure the foods you are feeding do not contain excessive amounts of iodine. Many cat owners are unknowingly making their cat's hyperthyroidism worse by supplementing with marine products that are high in iodine such as kelp. Iodine is a misunderstood ingredient in human and pet thyroid problems and can greatly exacerbate thyroid problems when autoimmunity is involved. Nutritional supplements can greatly benefit your cat's hyperthyroidism by helping to regulate the immune system. There isn't one "magic formula" to resolve the issue because hyperthyroidism is a complex autoimmune condition affected by many factors. Here is a list of basic support needed for cats with hyperthyroidism. More specific product suggestions for your cat's individual needs can also be obtaining by email at: support@askariel.com These supplements can't reverse the damage that may have already been done to your cat's thyroid so medications will most likely be needed. But, they will help reduce the progression and severity of the condition and improve your cat's overall well being. Power Probiotic--This product benefits all cats but especially those with hyperthyroidism. Since the thyroid function is so intertwined with GI function, giving your cat supportive friendly bacteria is the first start in helping to rebuild a healthy immune function. Oxicell SE for Pets--This topical cream is packed with antioxidants, vitamins and nutrients to help support your cat's overall health. Since hyperthyroidism is fueled by inflammation, Oxicell SE For Pets is the first line of defense for bringing down the inflammatory cycle. It contains key antioxidants such as glutathione and SOD. NotaSAN and QuentaSAN--These immune support drops are easy to administer and for some cats, can finally enable them to get off an endless cycle of antibiotics for chronic infections. When your cat is getting UTIs, URIs or other types of infections, it wears down the immune system. Since any type of autoimmune disease is a symptom of an overloaded immune system, using these drops can help quiet down infection and inflammation which is contributing to the hyperthyroidism. Immune Harmony---This natural plant based sterol formula has helped many cats with all types of autoimmune conditions including stomatitis, IBD and hyperthyroidism. Renelix--Hyperthyroidism can mask kidney problems in cats. Renelix is a powerful kidney detox that will protect and preserve your cat's kidney function. It also helps to flush out toxins related to the hyperthyroidism. If you need a diet suggestion for your kitty, please include the diet you are feeding on the AskAriel order form at checkout. A diet suggestion for feline hyperthyroidism (based on your cat's preferences) will be included on the packing slip that comes with your product order.